By Elizabeth Edgerton M.S., Kevin Erickson M.Sc. The introduction of species into areas outside of their native habitat is a concern for all ecosystems, both terrestrial and aquatic. These non-native introductions occur through a variety of pathways including intentional introductions, accidental releases, and natural events such as hurricanes. The majority of species released into new, non-native areas either are not able to establish within the introduced range, or are able to establish but do not cause significant damage. However, a small percentage of these introductions become established and cause severe environmental and economic damage; these are referred to as invasive species. In the marine environment, accidental release through the ballast water exchange of oceangoing vessels has traditionally been cited as the most likely pathway for marine species introductions (Carlton & Geller 1993). Recent studies have shown, however, that the marine ornamental trade is also a source. It is estimated that one-third of the world’s worst invasive species stem directly from the aquatic and ornamental trade. This figure represents both freshwater and marine species, though the majority are from freshwater systems (Lowe et al 2000). Invasion success usually depends upon characteristics of the invader like growth rates and the species’ position within the foodweb, and qualities of the non-native habitat like productivity and how much human-caused damage has occurred to the environment. However in the marine environment, invasion success is more dependent on the number of individuals released and the frequency of releases, this is often referred to as propagule pressure. In order for a species to successfully establish, individuals must be able to find each other for breeding; if a small number of individuals are released into a marine environment, the chances of them encountering each other in the wild are much lower than if they were in captivity (Gertzen et al 2008, Lueng et al 2004). The more individuals released into an area, especially if they are released all at once, the more likely it is that the species will be able to establish. It makes sense, then, that the more popular a species is within the aquarium and ornamental trade, the more likely that species is to be released into the wild, increasing the chances of a successful invasion. Still, some non-natives will successfully establish even if only a small number of individuals are released. Lionfish, which we will discuss later, successfully invaded the Atlantic following a small release event. Additionally, plants are often able to multiply without having to produce seeds through vegetative propagation, a process where plants clone themselves to produce more plants. So, a single plant fragment that is introduced into an ecosystem has the potential to grow into a large infestation. One factor that may increase a marine ornamental species chances of being released into the ecosystem, leading to increased odds of becoming invasive, is size. Many species of fish, like grouper and snapper, are found in the aquatics trade as juveniles. At this young age fish may only measure three to five inches in length, an ideal aquarium size. However these species will eventually become much larger with some fish like the spotted coral grouper (Plectropomus maculatus) reaching over four feet in length, much too large for the average home aquarium. Finding a new home for a fish of that size can be difficult, so, release into the natural environment may seem like the best or most humane option (Holmberg et al 2014). Although aquariums and the ornamental trade have been popular for many years, it was not until very recently that the release of marine ornamentals, and their establishment in non-native areas, was closely monitored. In the early 2000s, there were over two million public and private aquariums worldwide and the global aquarium and ornamental trade was growing by an estimated 14% per year, (Padilla and Williams 2004). Roughly 10 million marine organisms including fish, plants, corals, and invertebrates are traded each year, with the United States being the single largest importer (Rhyne pers comm. 2016). Although the number of invasive marine species is currently lower than the number of freshwater invasives, the number of marine invasions is increasing. As the marine ornamental and aquarium trade continues to grow, so does the likelihood of new invasive marine species. These species have already caused a significant number of environmental and economic impacts that extend well beyond their introduced range. Here, we will discuss a number of those impacts, as well as a few examples of marine invasive species. Impacts from marine invasive species can be found worldwide. 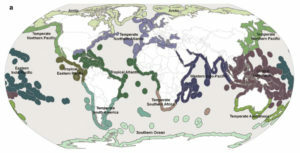 A recent study divided the global marine environment into 232 ecoregions, areas made up of relatively similar species, and looked at species introductions within those ecoregions. Results showed that only 16% of the ecoregions had no documented marine invasions, although that number may actually be smaller due to underreporting (Spalding et al 2007, Molnar et al 2008). Biogeographic realms with ecoregion boundaries outlined. Spalding et al 2007. The largest environmental impact from invasive species is reduced biodiversity (Gallardo et al 2015). When an invasive species is introduced to a new area, they come into direct competition with native species in the ecosystem. The invasives are often able to outcompete native species for food and habitat, driving the natives out, and eventually leading to a decrease in the overall number of species in the area. Additionally, invasive species generally have very few to no predators in their introduced range and are not affected by diseases that help to keep the native species populations from becoming too large. Invasive species are able to multiply freely without any of these limitations, pushing out native species that compete with them for food and habitat. Other environmental impacts include changes in the community structure and the food web within the ecosystem, and changes in nutrient cycles and sedimentation rates. Marine invasives also lead to a number of economic impacts including decreased productivity within marine fisheries, revenue losses from decreased tourism, and increased costs associated with invasive species control. Once a species becomes established in a new area it is very unlikely that it will ever be completely eradicated, so costly control measures must be attempted to try to reduce the invasives impacts on the area. Control of a single invasive species in a region can cost millions of dollars each year. In the United States, environmental and economic costs associated with invasive species were estimated to be $120 billion annually in the early 2000s (Pimentel et al 2004), that number has most likely increased since then. Invasive species can also attach to ship hulls, creating a thick layer which must be removed, and can clog water intake pipes, disrupting water production for public use and potentially creating water shortages. Lionfish are native to the Indian and Pacific Oceans including areas near southern Japan, southern Korea, and the east coast of Australia. This brightly colored, showy fish has been popular in the aquatic and ornamental trade for a number of years and were either intentionally or accidentally introduced to the western Atlantic Ocean near Dania Beach, Florida around 1985. For a more in depth discussion on the history and biology of lionfish, please refer to our previously published Lionfish Education Article “Lionfish in the Atlantic and Caribbean”, found here. Since the initial introduction lionfish have multiplied rapidly, expanding north along the east coast of the United States, into the Gulf of Mexico, and as far south as the northern edge of South America. The species is expected to reach the east coast of South America in the coming years. The infestation includes two varieties of lionfish, Pterois volitans and Pterois miles, though the majority of invasive lionfish found in the Atlantic are P. volitans (Freshwater et al 2009). Lionfish are not the first marine fish species to successfully establish in a non-native area, but are believed to be the first to become a successfully established invasive that resulted directly from an aquarium release (Semmens et al 2004). The lionfish invasion in the Atlantic is a “perfect storm” scenario, with many factors ensuring their survival in the introduced range. Lionfish are able to reproduce at extremely high rates, one female can lay over two million eggs each year resulting in an explosive increase in numbers in a very short time period. Lionfish are also expert hunters with an endless appetite; anything these fish can fit into their mouth is likely to be eaten, and at a rapid rate. In the Bahamas, lionfish have been observed consuming an average of one to two prey per hour, and have been known to eat over 20 juvenile fish in just 30 minutes (Albins and Hixon 2008). In addition to reproducing quickly and being successful hunters, lionfish have very few predators in their non-native range. Long spines on the fish’s body make it look larger than it actually is, deterring would-be predators. Since the spines are also venomous, predators that do attempt to eat the lionfish are usually not successful; they quickly release the fish and it swims away, unharmed. Lionfish are found in much higher numbers in their introduced range than in their native range. In the Atlantic, lionfish can be found at densities of 158 fish per acre or more; in the native range, the highest densities found are around 32 fish per acre (Green and Côté 2008, Fishelson 1997). The lionfish’s rapid spread, lack of predators, and voracious appetite could lead to major decreases in many other fish species, and have already begun to impact fish populations. This includes economically important food species like grouper and snapper, and many species found on coral reefs, which are also popular in the ornamental trade. A recent study identified the top ten most common families of fish that make up the lionfish diet in the Atlantic; seven of those top ten families are popular ornamentals (Morris and Akins 2009). Though complete eradication of the invasive lionfish is extremely unlikely, ongoing management to help control the lionfish population, and research to monitor how the invasion is progressing, is taking place. NOAA, the National Oceanic and Atmospheric Administration, recommends five steps to help control the invasion, including tracking the population and conducting research, educating the public on the dangers of releasing aquarium species, notifying physicians that the venomous fish is in nearby waters, and regulations to control the species (NOAA 2011). Control efforts carried out at the local level are thought to be the best method for lionfish control. Spearfishing for lionfish has become popular in many areas of the Caribbean and the Gulf of Mexico, and is open to anyone who wants to participate. In the Florida Keys, divers can be found spearing lionfish on any given day, and there are derby-style events that are planned where people can compete to collect the fish (fla-keys.com 2014). Lionfish is also edible, contain higher levels of healthy fatty acids than some other native fish species in the Caribbean, and can be found on menus in many restaurants in the area (Morris et al 2011). Caulerpa (Caulerpa taxifolia), a popular marine ornamental plant, is native to the Indian and Pacific Oceans and has been grown in aquaria since the early 1970s. Caulerpa is recognized as one of the top 100 worst invasive species in the world and has invaded a number of locations worldwide including the Mediterranean Sea and southern California (Lowe et al 2000, Jousson et al 1998, Jousson et al 2000). Like many other plant species, Caulerpa is able to reproduce vegetatively; a one centimeter fragment is able to clone itself and has the potential to grow into an entire underwater meadow in a short period of time. 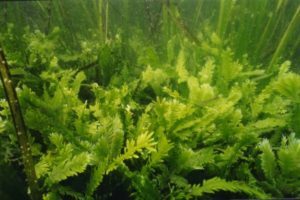 Additionally, the ‘strain’ of Caulerpa that is grown in aquaria has a number of characteristics that make it a more successful invader than the strain found in the native range. The aquarium strain can survive in colder temperatures, grow much larger and at much lower depths, and grows in much higher densities than the native strain (Meinsz and Hesse 1991, Wright 2005). Caulerpa has impacted its introduced range in a number of ways. 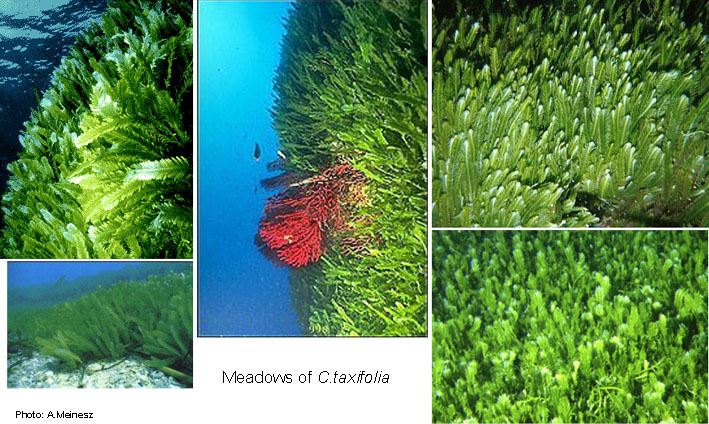 Growing in large, thick stands, Caulerpa greatly reduces or completely crowds out other plants. In some areas, Caulerpa takes the place of native seagrass beds, which are the preferred habitat for a variety of ecologically and economically important fish species (York et al 2006). Many of these species will leave the area once the seagrass beds are gone, resulting in fewer fish species in the ecosystem. Worldwide distribution of Caulerpa taxifolia. Yellow squares = native range. Orange circles = invasive populations of Caulerpa taxifolia. Dashed line = 15°C average winter sea-surface temperature. Modeled after Verlaque et al. 2000. The first documented invasion of Caulerpa occurred in 1984 near Monaco and was the result of a release from a public aquarium (Meinesz and Hesse 1991). It was believed early on that the Caulerpa invading the Mediterranean came from the ornamental trade; this thought was confirmed through DNA testing (Wiedenmann et al 2001). Caulerpa began to spread very quickly after it was released into the Mediterranean, covering around 2,400 acres and pushing out native plant species. No major control attempts have been made in the Mediterranean, and today the infestation still covers thousands of acres of ocean floor (Simberloff 2009). In California, Caulerpa first invaded two small sites near the southern coastline in 2000, Agua Hedondia Lagoon and Huntington Harbor. Like the Mediterranean invasion, this invasion also most likely resulted from an aquarium release (Williams and Grosholtz 2002). Because of Caulerpa’s status as a serious invader, preventative monitoring was already taking place, and the invasion was discovered soon after the initial introduction. Shortly after the invasion was first noticed, multiple state and federal agencies and private companies worked together to attempt to eradicate the invader before it was able to spread. Using tarps, the Caulerpa was covered and sealed off. Next, high doses of chlorine bleach were injected under the tarps, killing off the plants. These tarp and chlorine bleach treatments were performed multiple times over a roughly a year timespan. It seems that these efforts were successful, no more Caulerpa has been found near the original infestation sites. Eradication came with a steep price tag though, the removal of those two small infestations cost over $7 million. This eradication project resulted in ecological costs as well; native species were impacted as a result of the chlorine bleach treatment, though it seems that native populations of plants and animals were eventually able to recover following the treatment (Merkel and Associates, Inc 2006). Although Caulerpa was successfully eradicated, reintroduction of the species remains a serious risk. The species is still readily available in a number of retail stores in California despite the importation, sale, or possession of the species being banned in the state in late 2001 (Diaz et al 2012). ‘The Sun Coral’. The feeding of a Tubastrea coccinea coral cluster. 2010 Coral Morphologic. Sped up 10 times to emphasize the feeding abilities and coordination between the sticky tentacles and the polyps’ mouths. Cup coral (Tubastraea coccinea), is a member of the sun coral family, named for their bright colors and tentacles that resemble sunrays. This stony coral species is an azooxanthellate (NPS) coral, meaning it does not contain algae. Because of this, cup coral are able to grow as deep as 40 meters or more, much deeper than the light-craving zooxanthellate species who need shallow water and plenty of light to maintain the algae that live within them. Cup coral can also tolerate much colder temperatures than the shallow water species, allowing them to be tolerant of a much wider range of environments (Paula and Creed 2004, Fatherree 2011). Cup coral are invasive in many areas throughout the world, including the western Atlantic near Puerto Rico, the Gulf of Mexico including Florida and the Flower Garden Banks, and Brazil (Cairns 2000, Castro and Pires 2001, Fenner and Banks 2004). Like many other invasive species, cup coral is native to the Indian and Pacific Oceans. Possible routes of the spread of Tubastraea coccinea in the Caribbean, Gulf of Mexico, and Florida. Year of the earliest report in different areas is shown, along with possible routes of spread, based on dates and current paths. 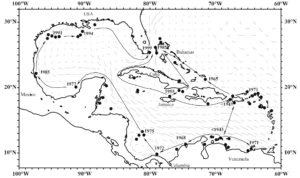 Small arrows present the generalized current paths in the Caribbean, Gulf of Mexico, and Florida. From Fenner and Banks 2004. This species is highly opportunistic, colonizing nearly any open space that it can find. Cup coral also grow very quickly, up to 5 centimeters a year, and produce offspring year-round either sexually, through the release of ovum and sperm, or asexually through polyp buds that grow on the parent coral and then break off to form a new colony (Fenner and Banks 2004, Fatherree 2011). Cup coral reach sexual maturity at a young age, around 1.5 years, allowing them to reproduce quickly and often. (Glynn et al 2007). Recent studies suggest that cup coral also use chemical defenses to keep other corals from establishing nearby; this defense also seems to deter would-be predators from attempting to eat cup coral (Lages et al. 2010). It is believed that current cup coral infestations most likely occurred via transfer on oil platforms and ship hulls. However, the risk of future infestations as a result of aquarium release is high. Cup coral is popular in the aquarium and ornamental trade, and can be shipped almost anywhere in the world through online retailers. Owning an aquarium and caring for the ornamental species that live in it is a long-term commitment. Before a hobbyist decides to spend the time and money to set up a tank, there are a number of factors that should be considered. Different species of plants and animals have varying needs regarding feeding requirements, tank size, and even the other species that they can live with in a tank. It is also important to understand how long individuals will live and if they are likely to reproduce in the aquarium setting. 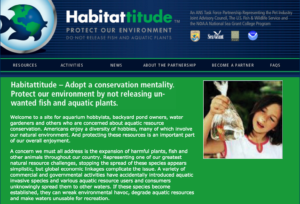 The Habitattitude campaign. A US initiative from the ANS Task Force public awareness campaign that is sponsored by the U.S. Fish and Wildlife Service. Understanding these factors and choosing species based on the time and financial commitment that the hobbyist is prepared to give to their aquarium can help to reduce the likelihood of needing to rehome the tank inhabitants. However, a situation may arise in which the hobbyist is no longer able to care for their marine ornamentals. A species may become too large for the tank, may start eating other tank inhabitants, or may reproduce resulting in too many of a particular species. If the time or financial responsibilities become too great, a hobbyist may decide to no longer keep an aquarium. Sometimes people decide to release marine species so that they can live a happy life, out in the open ocean. Recently, a group of Buddhist monks on Prince Edward Island, Canada, bought over 600 pounds of live lobster that were to be sold as food, and returned them to the ocean so they could “find a spot where there are no cages waiting for them” (Ross 2016). The ‘Pet Fish Belong’ campaign. A UK initiative from the Ornamental Aquatic Trade Association (OATA). Releasing species into the wild may seem like a good idea, but they should never be introduced into the environment. The majority of marine ornamentals that are released into the wild do not survive anyway, as they are not prepared for life in the wild environment and will likely succumb to starvation or predation. So releasing your ornamentals to enjoy a life of freedom is an unlikely outcome (OATA 2016, OATA/REPTA 2016). For those that do survive, their introductions can potentially lead to a number of negative impacts to the environment and the economy. Even if the species is native to your area and would not become an invasive, you should never release an unwanted marine ornamental, as they may harbor diseases that could spread to wild populations (Morrisey et al 2011). Some common diseases found in marine ornamental fish include Cryptocaryon irritans (marine whitespot disease) and Amyloodinium ocellatum (marine velvet disease). If you no longer want or are no longer able to care for you marine ornamental species, there are a variety of options available to you. 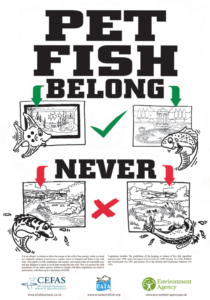 Consider posting fliers in pet stores or local fish stores, advertising your healthy unwanted marine ornamentals for sale or donation to other hobbyists. Another good option is to join your local aquarium club, where you can advertise the marine ornamentals you wish to rehome. Hobbyist groups also often provide events where members can buy, trade, and sell marine ornamentals. To find a club near you, check out our directory: http://masna.org/membership/directory/masnaclub. If your marine ornamental is diseased, sick, or dying, there are also a variety of options for humanely euthanizing and properly disposing of them; talk to your veterinarian to determine the best option for you. Never flush diseased or dying fish down the toilet, as this is a highly inhumane method of euthanasia. Live rock and plants can be allowed to dry out completely and then disposed of in the garbage or buried in the garden (Western Australia Department of Fisheries – “Don’t dump that fish!” brochure). Marine invasive species are a growing concern around the world, but there are ways you can help monitor and manage the spread of existing invasives. In addition to removing known invasives, like the lionfish spearing we discussed earlier, you can help by reporting invasive species sightings. REEF.org has an Exotic Species Sighting Program, where recreational divers and snorkelers can report invasives that they find out on the reef. If you spot an invasive species, you can use REEFs Exotic species sighting form to document your findings. Want to learn more about our known marine invasive species? REEF.org has information on invasive species. Additionally, the United States Geologic Survey has a Nonindigenous Aquatic Species database, that provides detailed information on invasive plants and animals. Elizabeth Edgerton is an aquatic scientist specializing in invasive species research. She has a Bachelor’s degree in Environmental Studies from Baylor University and a Master’s in Wildlife and Fisheries Sciences from Texas A&M University. 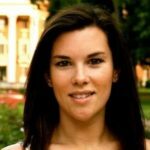 Elizabeth has a passion for marine wildlife and enjoys snorkeling in a variety of marine environments including the Caribbean, the Gulf of Alaska, and the Great Barrier Reef. She currently lives in Central Texas with her beagle mix Bailey. You can contact Elizabeth by email at LizEdgerton10@gmail.com. – Carlton J, Geller J (1993) Ecological Roulette: The Global Transport of Nonindigenous Marine Organisms. Science 261: 78-82. – Lowe et al. (2000) 100 of the World’s Worst Invasive Alien Species: A Selection from the Global Invasive Species Database. http://www.issg.org/pdf/publications/worst_100/english_100_worst.pdf. – Gertzen E, Familiar O, Leung B (2008) Quantifying Invasion Pathways: Fish Introductions from the Aquarium Trade. Can. J. Fish. Aquat. Sci. 65: 1265–1273. – Leung B, Drake J, Lodge D (2004) Predicting Invasions: Propagule Pressure and the Gravity of Allee Effects. Ecology 85: 1651-1660. – Holmberg R et al. (2015) The 800-Pound Grouper in the Room: Asymptotic Body Size and Invasiveness of Marine Aquarium Fishes. Marine Policy 53:7-12. – Padilla D, Williams S (2004) Beyond Ballast Water: Aquarium and Ornamental Trades as Sources of Invasive Species in Aquatic Systems. Front Ecol Environ 2: 131-138. – Spalding et al. (2007) Marine Ecoregions of the World: A Bioregionalization of Coastal and Shelf Areas. Bioscience 57: 573-583. – Molnar J, Gamboa R, Revenga C, Spalding W (2008) Assessing the Global Threat of Invasive Species to Marine Biodiversity. Front Ecol Environ 6, doi:10.1890/070064, www.frontiersinecology.org. – Gallardo B, Clavero M, Sanchez M, Vila M (2015) Global Ecological Impacts of Invasive Species in Aquatic Ecosystems. Global Change Biology doi: 10.1111/gcb.13004. – Pimentel D, Zuniga R, Morrison D (2004) Update on the Environmental and Economic Costs Associated with Alien-Invasive Species in the United States. Ecol Econ 52: 273-288. – NOAA (2011) Can We Stop the Invasion? 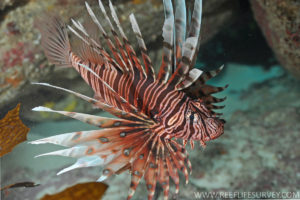 http://oceanservice.noaa.gov/education/stories/lionfish/lion05_stop.html#top. – Freshwater et al. (2009) Mitochondrial Control Region Sequence Analyses Indicate Dispersal from the US East Coast as the Source of the Invasive Indo-Pacific Lionfish Pterois volitans in the Bahamas. Mar Biol doi:10.1007/s00227-009-1163-8. – Semmens B, Buhle E, Salomon A, Pattengill-Semmens C (2004) A Hotspot of Non-Native Marine Fishes: Evidence for the Aquarium Trade as an Invasion Pathway. Mar Ecol Prog Ser 266: 239-244. – Albins M, Hixon M (2008) Worst Case Scenario: Potential Long-Term Effects of Invasive Predatory Lionfish (Pterois volitans) on Atlantic and Caribbean Coral-Reef Communities. Environ Biol Fish 96: 1151-1157. 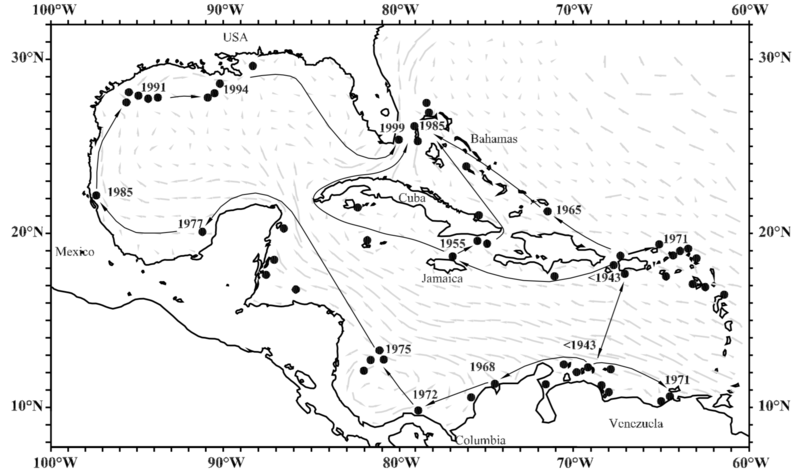 – Green S, Côté M (2008) Record Densities of Indo-Pacific Lionfish on Bahamian Coral Reefs. Coral Reefs 28:107. – Fishelson L (1997) Experiments and Observations on Food Consumption, Growth and Starvation in Dendrochirus brachypterus and Pterois volitans (Pteroinae, Scorpaenidae). Environ Biol Fish 50: 391-403. – Morris J, Akins J (2009) Feeding Ecology of Invasive Lionfish (Pterois volitans) in the Bahamian Archipelago. Environ Biol Fish 86: 389-398. – Fla-Keys.com (2014) Become a Local Lionfish Hunter http://www.fla-keys.com/news/news.cfm?sid=8919. – Morris et al. (2011) Nutritional Properties of the Invasive Lionfish: A Delicious and Nutritious Approach for Controlling the Invasion. AACL Bioflux 4: 21-26. – Jousson O, Pawloski J, Zaninetti L, Meinesz A, Boudouresque C (1998) Molecular Evidence for the Aquarium Origin of the Green Algae Caulerpa taxifolia Introduced to the Mediterranean Sea. Mar Ecol Prog Ser 172: 275-280. – Jousson et al (2000) Invasive Alga Reaches California. Science 408: 157-158. – Meinsz A, Hesse B (1991) Introduction et Invasion de L’algue Tropical Caulerpa taxifolia en Méditerranée Nord-Occidentale. Oceanologica Acta 14: 415-426. – York P, Booth D, Glasby T, Pease B (2006) Fish Assemblages in Habitats Dominated by Caulerpa taxifolia and Native Seagrasses in South-Eastern Australia. Mar Ecol Prog Ser 312: 223-234. – Wiedenmann J, Baumstark A, Pillen T, Miensz A, Vogel W (2001) DNA Fingerprints if Caulerpa taxifolia Provide Evidence for the Introduction of an Aquarium Strain into the Mediterranean Sea and Its Close Relationship to an Australian Population. Mar Biol 138: 229-234. – Simberloff D (2009) We Can Eliminate Invasions or Live With Them. Successful Management Projects. Biol Invasions 11: 149-157. – Williams S, Grosholz E (2002) Preliminary Reports from the Caulerpa taxifolia Invasion in Southern California. Mar Ecol Prog Ser 233: 307-310. – Merkel and Associates (2006) Final Report on Eradication of the Invasive Seaweed Caulerpa taxifolia from Agua Hedionda Lagoon and Huntington Harbour, California. http://www.globalrestorationnetwork.org/uploads/files/CaseStudyAttachments/71_c.-taxifolia-eradication.pdf. – Diaz S, Smith J, Zaleski S, Murray S (2012) Effectiveness of the California State Ban of Caulerpa Species in Aquarium Retail Store in Southern California. Environ Manage 50: 89-96. – Paula A, Creed J (2004) Two Species of the Coral Tubastraea (Cnidaria Scleractinia ) in Brazil: A Case of Accidental Introduction. Bull Mar Sci 74: 175-183. – Fatherree J (2011) Aquarium Corals: A Look at the Sun Corals http://www.advancedaquarist.com/2011/12/corals. – Cairns S (2000) A revision of the shallow-water azooxanthellate Scleractinia of the Western Atlantic. Stud Nat Hist Carib Reg 75:1−240. – Castro, C. B. and D. O. Pires. 2001. Brazilian coral reefs: what we already know and what is still missing. Bull. Mar. Sci. 69: 357–371. – Fenner D, Banks K (2004) Orange Cup Coral Tubastraea coccinea Invades Florida and the Flower Garden Banks, Northwestern Gulf of Mexico. Coral Reefs 23: 505-507. – Glynn P et al. (2008) Reproductive ecology of the azooxanthellate coral Tubastraea coccinea in the Equatorial Eastern Pacific: Part V. Dendrophylliidae. Mar Biol 153: 529-544. – Lages et al. 2010 Chemical defenses against generalist fish predators and fouling organisms in two invasive ahermatypic corals in the genus Tubastraea. Marine Ecology 31: 473-482. – Ross S (2016) P.E.I Monks Buy 600 Lbs of Lobster to Release Them Into Ocean. http://www.cbc.ca/beta/news/canada/prince-edward-island/pei-monks-free-lobsters-1.3672032. – OATA (2016) Pet Fish Belong. www.ornamentalfish.org/wp-content/uploads/2012/08/Pet-Fish-Belong.pdf. – OATA/REPTA (2016) Pet Code of Practice. www.ornamentalfish.org/wp-content/uploads/Pet-Code-of-Practice.pdf. – Morrisey et al. 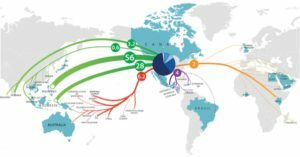 (2011) Characterization of the Marine Aquarium Trade and Management of Associated Marine Pests in Australia, a Country with Stringent Import and Biosecurity Regulation. Environ Cons doi:10.1017/s0376892911000014.